In the past year or so I've finally gotten over my lifelong aversion to tea. In general, I've never been a big fan (and am still a skeptical convert) of tea drinking. To me, it just tastes like water boiled with faintest hint of flavor. It always seems to smell great but then tastes like nothing. When I saw this Pumpkin Spice tea, however, I had to get some. While I'm not a big fan of tea, I am a very big fan of Pumpkin Spice anything. One of my problems with tea has always been that it tastes so weak. I usually liked it a lot more of I used several tea bags so it can out ultra-concentrated, but it can get expensive if you're always using 3 tea bags for a single cup of tea. However, I discovered earlier this year after buying some expensive Chai tea from Teavana that you can actually reuse your tea (bagged or loose-leaf) up to three times before it runs out of flavor. So since I usually drink tea cold anyway, I've taken to making a big batch, using 3 tea bags for 1 cup of water, and then using each tea bag 3 times, so that you get a highly concentrated brew without going through an insane number of tea bags. (Note: If you're thinking that it would be even easier to just steep the tea for 3 times as long rather than reusing the tea bags 3 times-don't! Steeping the tea for longer than intended can burn it. It's better to steep the tea for the recommended time, then remove the tea bag and put it in the fridge to cool before using again.) Even using this method, I still sometimes run into the problem of tea that's on the flavorless side (for me, at least), but it's better than using 1 tea bag for every cup of water. 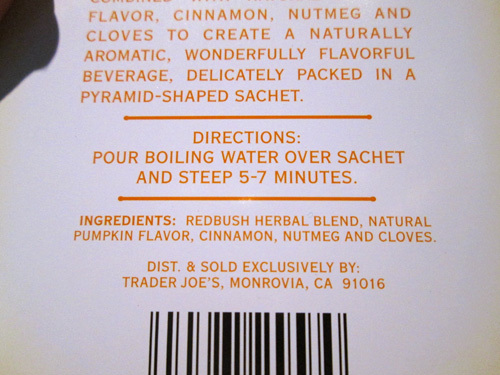 But back to how Trader Joe's Pumpkin Spice Tea rates. After brewing up about 2 liters of this stuff, I finally poured myself a glass to try, and oh my god was it good! It has a great pumpkin-y flavor, and you can really taste the "spice" part of it too. Even cold, it has a nice warmth to it thanks to the cinnamon and nutmeg. This is easily my new favorite drink of the fall. 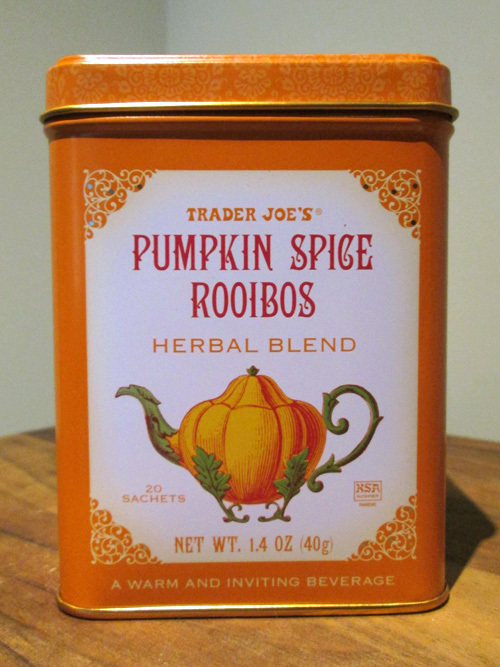 In fact, since buying my first canister of this about 6 weeks ago, I've already bought two more, and I'm strongly considering stocking up on a few more to get me through until next Pumpkin Season at TJ's.